My friend Siri and I met on monday for a bloggers meet in Hyderabad. While the talk we attended per se was not much to talk about, it was a chance for us to meet many bloggers we had been reading or following but had never met, and for the two of us to meet after ages. We proceeded to have coffee and then went out for lunch. Severely missing the other conspirator Pree. Over some yummy chilli cheese toast and a pub lunch, we gossiped, checked out the other people at the pub, gossiped some more and shared notes on what has been happening in our lives. In my defence, I did think the double beans sundal was better than most sundals. Purely because double beans is one of my favourite beans, I love its texture and it lends itself beautifully to any recipe. this recipe needs a little of pre work in soaking dried beans for atleast 4-5 hours. Once pressure cooked, there is nothing really to do except temper it. Drain the water off the boiled beans and set aside. In a kadai, heat the ghee, add the mustard and splutter, add the curry leaves, dried red chillies and hing and turn off the heat. Add the grated coconut and toss. Add the boiled beans to this, add salt and mix gently. Serve when still warm. This is such a refreshingly new twist. 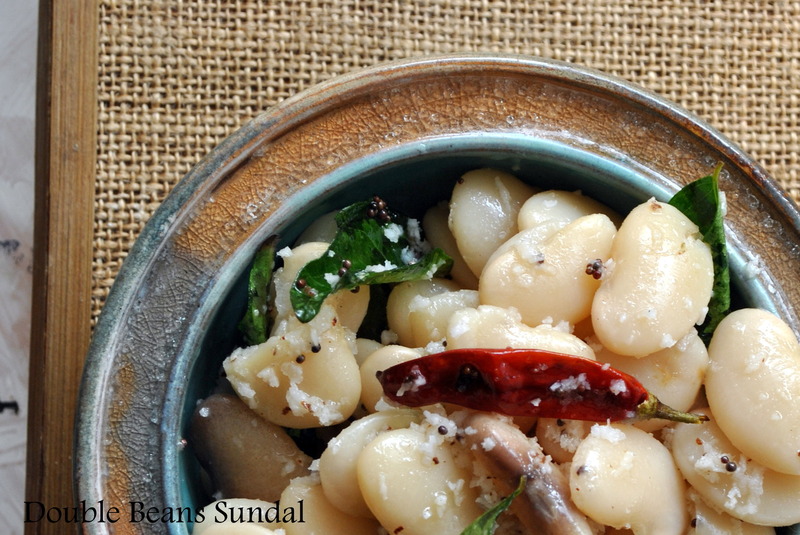 used to cook with double beans a lot when we were in Bangalore but hardly get them here. Thank you Sayantani. Try to find dried double beans in the supermarket aisles where channa and whole moong are stocked. it is quite easily available in hyderabad. Else do let me know, I can send over a couple of packets.